A loggerhead swims back to the sea following her release after treatment at the sea turtle rescue center at İztuzu Beach in Dalyan, Muğla. Hundreds of sportspeople from around the world will gather in the Mediterranean coastal town of Dalyan in the province of Muğla to take part in the 4th Dalyan Open Sea Swimming Race. The race which is scheduled to take place on April 27 and 28 will set off under the event slogan "Swimming with loggerheads." This year, racers will swim in two separate swim lanes and male and female sportspeople will race in different age categories. The athletes will get to the starting point from İztuzu Beach via boats and they will be struggling to get to first place at the end of a 2,400-meter swimming lane. Dalyan and İztuzu Beach are important breeding spots for loggerhead turtles, also known as carettas, in the Mediterranean coast. 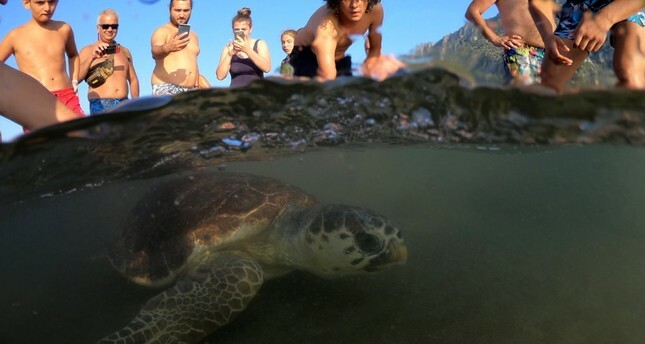 There are 21 caretta nesting spots in the Aegean province of Muğla and the Mediterranean provinces of Antalya, Mersin, Adana and Hatay; however, there is no doubt that the most popular nesting area for these giant turtles is the İztuzu Beach in Muğla, which was placed under government protection in 2015. Volunteers come to the İztuzu Beach in summer and every month a team of at least 100 volunteers take care of these giant turtles. The volunteers come to the beach from all over Turkey and over the last couple of years, the program has also attracted international volunteers from the U.S., U.K. and Germany.